This event was reason enough for our Ground Controller David Hagenstroem to draw a memorable comic. Of course we wanted Samantha to know that we are aware of her new ‘power’ – that is why we wanted to bring her the comic on the Space Station. Back to the comic: In principle, astronauts can receive emails on the Station. But for your email to actually arrive in their inbox, you need to be on a special list that the astronauts manage themselves. Working at a control center we could of course use this communication channel, but we chose another way. Every day the crew receives a “daily summary” that is prepared on ground and radioed up. This document includes comments on the day’s schedule, various Space Station parameters and a question-and-answer section. We sometimes add a caricature, a riddle or another bit of fun to make our colleagues in space start the day with a smile. 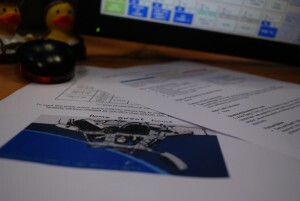 Astronauts are encouraged to study the Daily Summary in the morning so that any questions or comments they have can be asked during the daily planning conference. Hi there! My name is Serkan Yaray. I am from Turkey. First of all I want to tell you something. As a member of humankind, I want to thank all of you for your precious works. And I want to request a favour from you. I will propose my girlfriend in July and I want to prepare a suprise for that moment. Hence, I started collecting good wish messages of people from all 245 countries in their mother languages. But to make this suprise unforgettable I would like to ask if a member of ISS crew could write on a paper ” Gülce, he loves you very much! 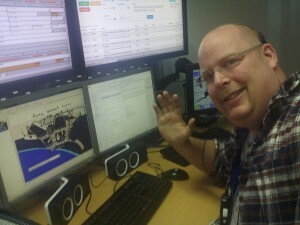 Please say yes, greetings from ISS ” and send it via email? If you somehow make it happen, I will be the happiest person alive! Note: “Gülce” is my girlfriend’s name.